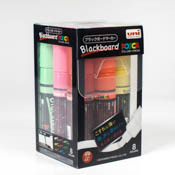 NEW Posca Blackboard PCE-200-5M or Chalk marker is weather resistant but wipes off easily using a damp cloth. Ideal for use in pubs, restaurants, shops etc. This set is in the bullet tip 2mm nibbed marker in all 8 colors. Great for writing out information. 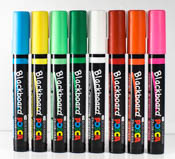 NEW Posca Blackboard or Chalk marker is weather resistant but wipes off easily using a damp cloth. Ideal for use in pubs, restaurants, shops etc. 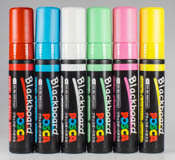 NEW Posca Blackboard PCE-250-8K or Chalk marker has an 8mm wide chisel tip marker. It is weather resistant but wipes off easily using a damp cloth. Ideal for use in pubs, restaurants, shops etc. 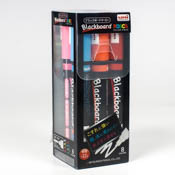 NEW Posca Blackboard PCE-500-17K or Chalk marker has a 15mm wide square tip. It is weather resistant but wipes off easily using a damp cloth. 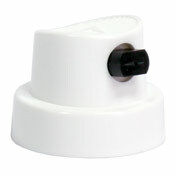 Ideal for use in pubs, restaurants, shops etc. 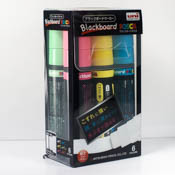 Great for writing in large lettering or coloring in bigger spaces.